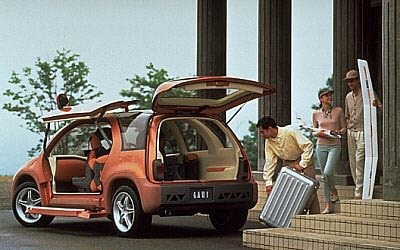 The Mitsubishi Gaus (Global Adventure Utility System) was one of the concept vehicles which made its debut at the 1995 Frankfurt Motor Show. 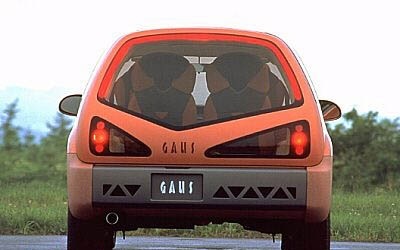 The Gaus was, as the full name suggests, a vehicle designed to provide globe-trotting capabilities and a versatile interior space. 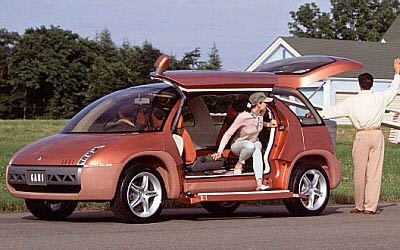 One of the defining features of the Mitsubishi Gaus concept was the unique door arrangement. It had three doors. On the driver's side was a conventional door which wasn't anything to get excited about. But on the passenger side there was a massive gull wing door which ran almost the entire length of the passenger compartment. This hydraulically operated door was split into two sections. The top half opened upward and tucked itself neatly above the roof. The lower section folded down to provide a handy step. At the rear of the Gaus was an asymmetrical third door which opened upward in a hatchback manner. 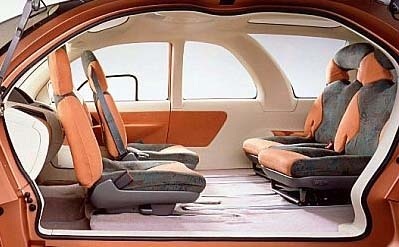 The interior of the Mitsubishi Gaus featured 4 individual seats for superior comfort and space. The front two seats could be turned around 180 degrees to face the rear seats when the vehicle was stopped for a more relaxed environment. The Mitsubishi Gaus concept was powered by a turbocharged 2.0 litre 4-cylinder engine which sent its power to all four wheels.